The pleasure of a moisturizing lotion with relaxing benefits. 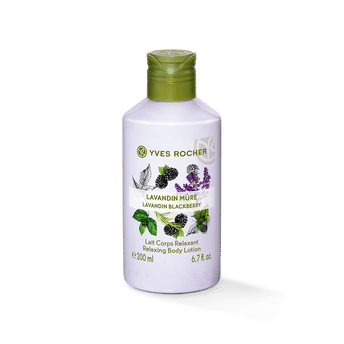 Formulated especially for dry skin that lacks moisture, the Yves Rocher Relaxing Body Lotion Lavandin Blackberry nourishes and hydrates your skin. Enriched with essential oil of Lavandin with blackberry, it gives a sense of well being and intense relaxation, this body lotion leaves the skin soft & relaxed. Botanical-based ingredients: Organic and fair trade Shea butter, Aloe vera gel from Organic Farming, lavandin essential oils (in the fragrance), Blackberry extract. About the Brand:A worldwide cosmetics and beauty brand, founded in 1959 by the French entrepreneur Yves Rocher (1930-2009) in La Gacilly, Yves Rocher offers an impressive selection of botanical beauty products: skin care, makeup, body care, fragrances, hair care, bath and shower products. Based on the richness of the botanical world and its infinite potential, the brand respects your skin and that is also respectful of nature, limiting its impact on the environment and, every day through its actions, actively taking part in the protection of biodiversity.